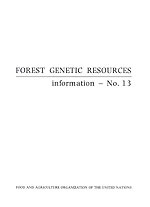 Planned international trials of Liquidambar styraciflua L.
Availability of seed of Central American Pines for ex situ conservation stands, provenance resource stands, breeding populations and provenance testing (G.L. Gibson and R.D. Barnes). Cover photo: Prosopis sp. in Baja California Sur, Mexico.